“This is our first step towards locally implementing Volvo’s global vision to have half of our global sales comprised of fully electric cars. Safer for the environment, better for everyone on the planet, “shares Volvo Philippines Marketing Head Christopher L. Yu. The Volvo S90 T8 Twin Engine combines a supercharged and turbocharged 4-cylinder engine with an electric motor. The internal combustion engine alone already generates 303 horsepower and 400 Nm of torque, but supplementing its performance is a 65-kW electric motor that boosts total outputs to 386 horsepower and 640 Nm of torque. Power is routed through an 8-speed automatic driving all four wheels. Even more interesting is that S90 T8 Twin Engine can be charged using a conventional power outlet. Using a 6-amp power outlet, it fully charges 11.6 kWh lithium-ion battery in 8 hours, while opting for a 16-amp output cuts it down to 3 hours. According to Volvo, the S90 T8 Twin Engine does 0-100 km/h in about 5.1 seconds and a top speed of 250 km/h. Yet, it can achieve up to 43 km/L thanks to a pure electric range of 46-50 kilometers. The price? A reasonable P 5,950,000. 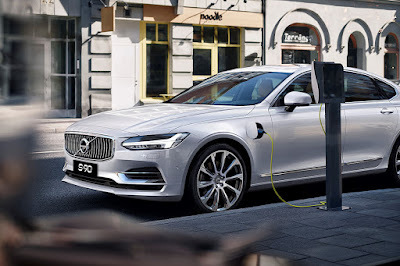 Moving forward, Volvo Cars Philippines will also introduce more electrified models featuring the T6 and T8 powertrain as well as the mild hybrid versions of the S90, XC90, and XC60 which adopt the “B” model designation. Plans are underway to introduce the XC90 B5 (mild hybrid petrol or diesel), XC90 B6 (mild hybrid petrol), XC60 B5 (mild hybrid petrol or diesel), XC60 B4 (mild hybrid diesel), and XC60 B6 (mild hybrid petrol).